I suppose you're wondering what we're wrapping the cushions... but I have to say, I'm a little embarrassed to share it. Yeah, the 50 year old foam that's oozing out of our disintegrating upholstery is pretty gross. Disgustingly gross. Awful, yucky, powdery foam literally blows out every time we sit down. Better, right? We think so. But the solution is temporary. 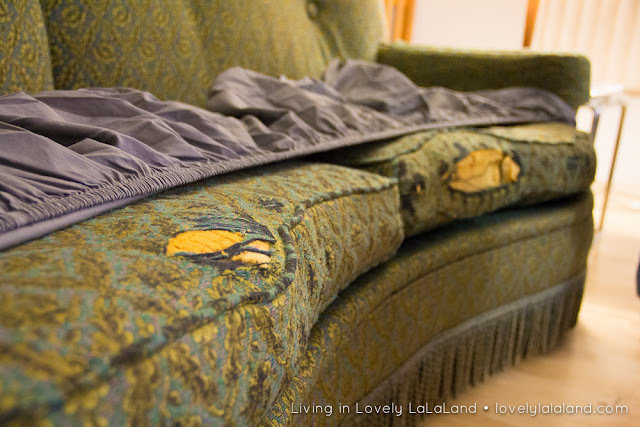 We have no plans to get rid of our fantastic, vintage, curvy, fancy sofa. It's a custom piece that was given to me by a member of our family. It's solidly built and beautifully crafted. And I loves it. Maybe we should do it in white? I've read that slipcovering in white denim makes it easy to clean when needed. But our existing tight back wouldn't be a slipcovered cushion. Maybe gray? I love the neutral and cool color that's similar to our general painting scheme. It feels timeless and modern at the same time. That's always a great thing. Maybe something a little more funky like green or blue velvet? Maybe. Though all of our discussions lead us to less of a bold statement with the piece. 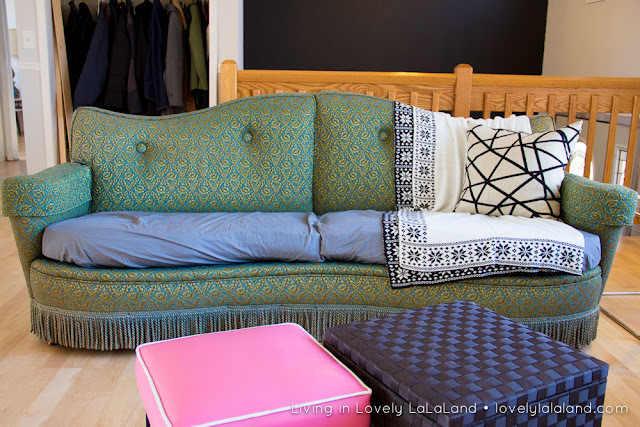 But then I see a sofa like this and think "Let's make a statement with the sofa!!" What do you think? We're not going to push the button on this project any time in the near future (there are a few too many more pressing items on our home improvement list) but one thing I've learned is that it's good to marinate the ideas a while. So, let's marinate. Any opinions on the sofa upholstery? Does anyone else have a dirty secret hiding under a sheet? Ha, that sounds odd. But you know what I mean! 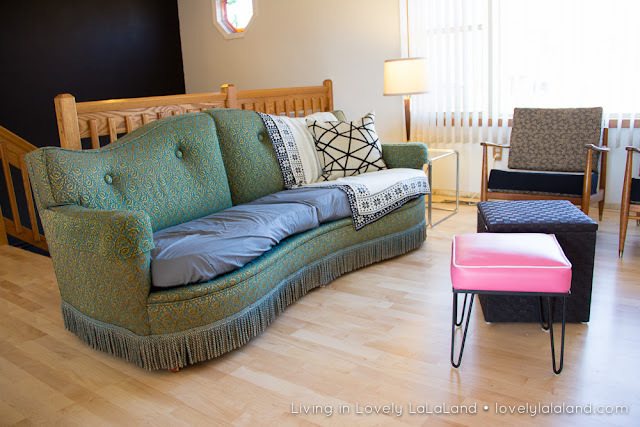 I LOVE your curved sofa--especially the fringe! I don't have any stuffing coming out--oh wait, yes we do. We have a chair with a hideous cushion. We just cover ours with some granny afghans we got at a thrift store. It's on my list, though! 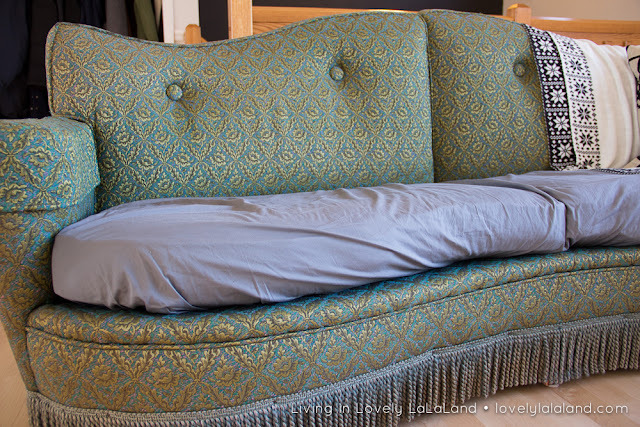 Your sofa will be awesome once you decide how you want to go with it. Can't wait to see it. Thanks Rita! Yes, it's a gem of a sofa. And I'm glad I'm not the only one hiding my need for upholstery work! I'm a statement girl you know. But I have all brown leather in my living room. Why? Because it's kid proof. If you plan to have kids ever pee,poop or puke on your sofa go with leather and don't go with white. Blue velvet or even a bright color would be gorgeous. But practicality has to win if you plan on becoming a mama! P.S I do hope you make me an auntie some day and I'll try to not have my kids puke on your sofa. I love your couch! The gray color looks gorgeous and timeless, but maybe not kid proof. If you go the professional route in the area please let me know. I have a big rocker my mom originally inherited from her aunt (I think) that I LOVE, but it must stayed covered since its guts are spilling out, too. Someday I will get that thing redone! Thanks Teresa! Yes, I really love the gray too. But my sister is right in saying it's not as kid friendly. Hmm.. I have some thinking to do! And yes, I'll share the details when we do finally get it upholstered!